“9. To the extent permitted by law, MassHealth may place a lien against any real estate owned by eligible persons or in which eligible persons have a legal interest. If MassHealth puts a lien against such property and it is sold, money from the sale of that property may be used to repay MassHealth for medical services provided. MassHealth does not tell you exactly what health coverage they will be charging your estate for after you die — one must assume it is any and all health care provided. Nor are you told about monthly “capitation charges” (charges per head – a nice way of thinking about the public) just for being enrolled. This charge for a typical enrollee comes to almost $500 per month. If you wish to find out what your debt is while you are still living, and request a statement, MassHealth will not make it easy for you to get it and the statement will be no more than a spreadsheet copied out of their database, with no explanation of charges. The MassHealth Estate Recovery Unit says that, by law, it is not able to process MassHealth claims until the MassHealth recipient is dead and his estate enters probate. After death, of course, the recipient is no longer able to speak for him or herself or question any charges. MassHealth is basically giving low income people a collateralized loan and withholding both the total amount of the loan and a full explanation of the conditions of the loan so that the enrollee can never know what his debt is. Nor is it possible to clear your debt while living, as there is no process for that. Those who are able to afford partial payments for their coverage are not subjected to estate recovery. In effect this is a penalty for being poor. People who wish to leave something to their children after they die, and not saddle them with a debt for their health care costs, would be better off not enrolling in MassHealth and instead paying their medical costs out of pocket. In a legitimate loan agreement you would be entitled to a regular statement of costs incurred. MassHealth does not provide this. The enrollee is not even told that MassHealth will be charging nearly $500 per month for coverage, with no health care actually being provided. No accounting of any kind is provided. In a legitimate loan agreement you would expect to have a signed contract specifying your obligations and the obligations of the loan provider. People signing the MassHealth application agreement are, with just one sentence, giving up their rights to the family home and all their possessions. The agreement states: “To the extent permitted by law, for any eligible person age 55 or older . . . MassHealth will seek money after the eligible person’s estate after death.” What is “the extent permitted by law”? The terms are so vague as to be deceptive. By signing the MassHealth application, you are agreeing to a loan whose final cost will only be arrived at after you’re gone. In a legitimate loan agreement you would have the right of informed consent. The MassHealth application does not provide this. You don’t even know what you’re agreeing to. In a legitimate loan agreement you would be able to review cost statements and contest charges that you never agreed to, or charges for services that you perhaps never received. Under MassHealth, you would be unable to contest any charges not only because you were never informed of charges as they were being incurred, but also because no claim would be made until you were dead. MassHealth does not allow questioning of costs while you are alive, and after you are dead it’s obviously too late. In a legitimate loan agreement you would be able to pay off the loan and get a receipt in return saying the debt was paid. If you offer to pay MassHealth to be free of your debt, MassHealth will tell you that you can make a voluntary payment but you will not be given a receipt saying that all debts are paid. Your debt to the state is only settled when the state conducts an estate recovery claim against you and that claim is only issued during the probate process after you die. This bureaucratic rule violates what one might call a basic human right to pay off and be free of a debt. In a legitimate loan, the lender would certainly make it possible for a loan to be paid off ahead of schedule (i.e., before you die). By this rule MassHealth puts people in the absurd position of not being able to pay a debt even if they want to. The terms by which MassHealth offers health coverage to low income people would, in any other context, be called fraudulent. The Commonwealth of Massachusetts has no business purveying health care by such deceptive means. To add insult to in jury if, after finding out about this scam, you decide to end your “coverage,” the Commonwealth will slap you with a “health care penalty” on your state tax returns for your failure to have health insurance. This amounts to coercion into an unfair agreement. Some might think it is irresponsible not to have health insurance. 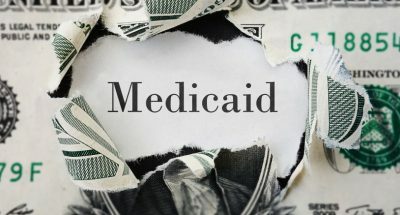 Actually, it is irresponsible for the state of Massachusetts, or any state offering a similar Medicaid program, to be offering open-ended loans disguised as health insurance. This article was originally published by Writings of Richard Hugus.